New 6.3-ounce aerosol can for continuous spray power and no need to pump or squeeze! 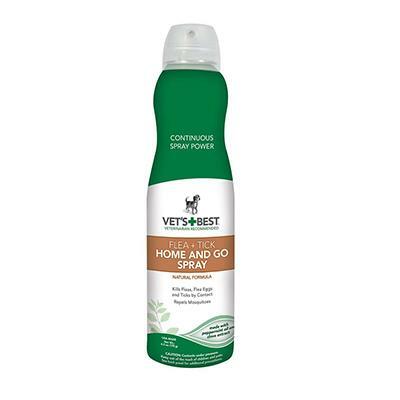 Kill fleas, flea eggs, ticks, and mosquitoes on contact without the need for harsh chemicals or toxic pesticides. Vet's Best Natural Formula Home and Go Flea and Tick Spray uses an unique combination of clove extract and peppermint oil, which invigorates your pet's skin and leaves them smelling good. Indoors or out, Vet's Best Flea and Tick Spray is safe for dogs, cats, puppies and kittens over 12 weeks of age.